The Small and Medium Enterprise (SME) Tariff-Tracker is an ongoing project for Energy Consumers Australia (ECA). 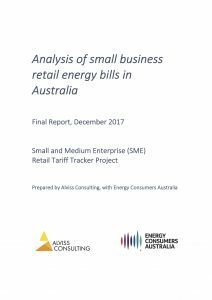 To date this project has collected and compared small business electricity and gas retail tariffs across Australia and developed a spreadsheet-based tool that allows consumer advocates, and other interested parties, to compare prices and produce their own analysis. The analysis presented in this SME Tariff-Tracker update report is based on retail offers available in October 2017 as well as those collected in April 2017 and April 2016.